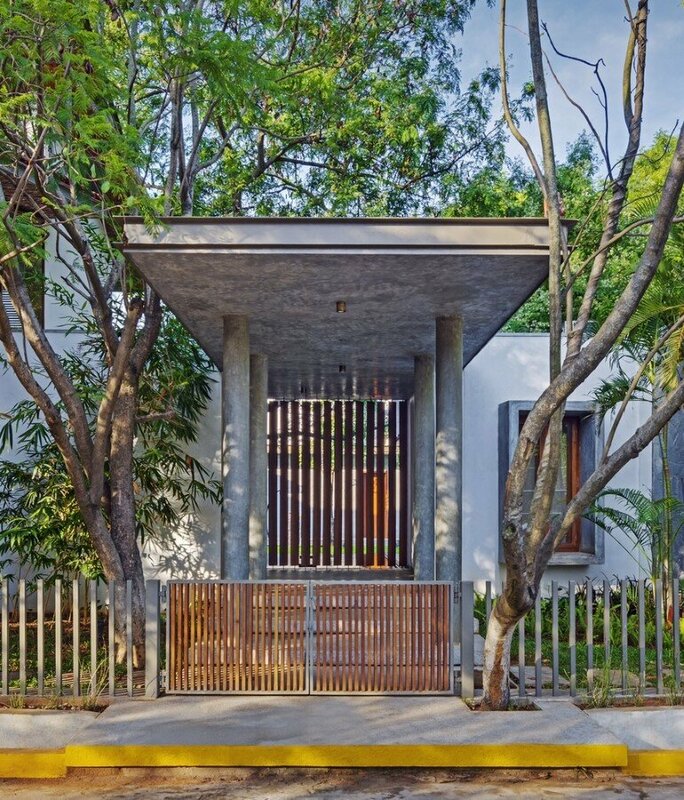 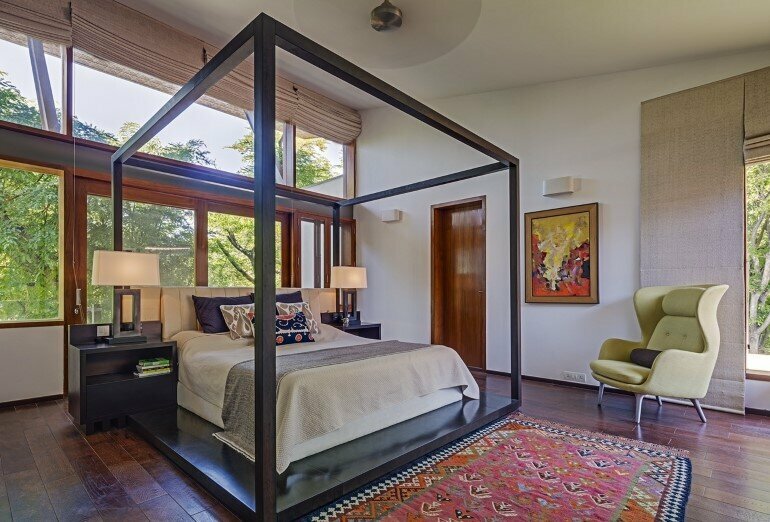 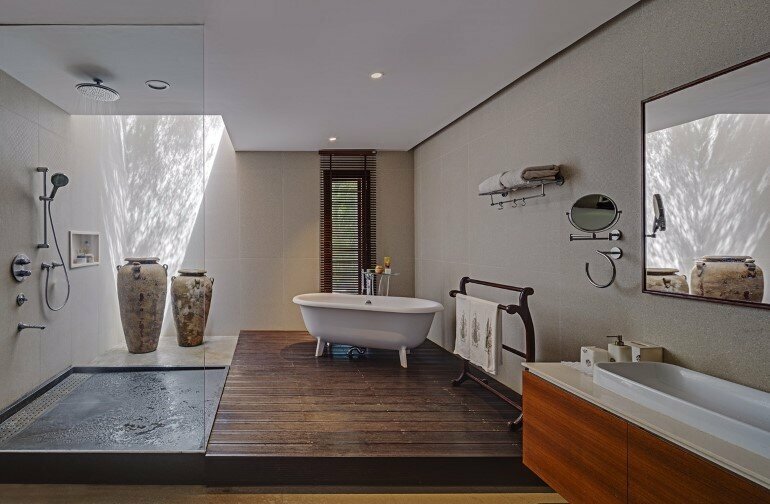 Krishnan house was completed in 2015 by Khosla Associates in Bengaluru, India. 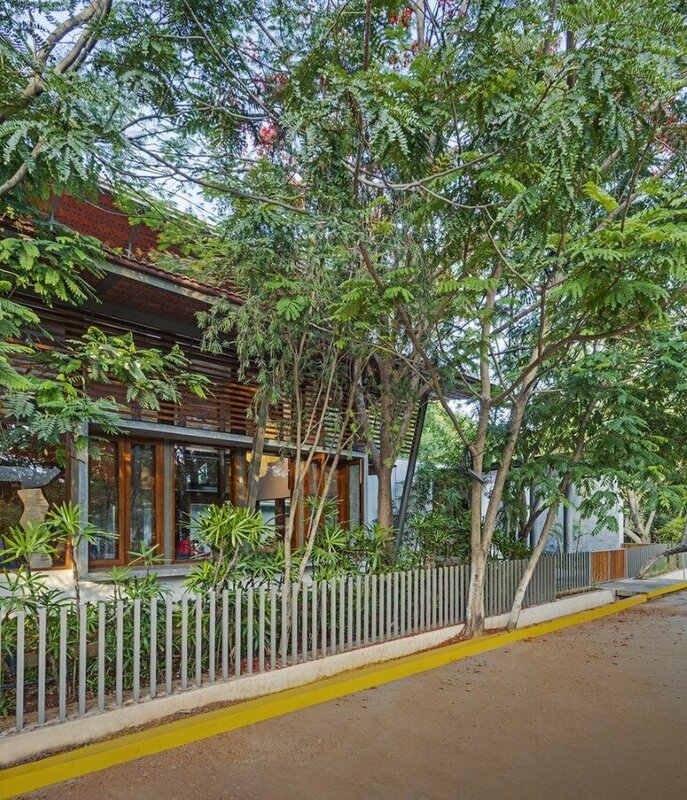 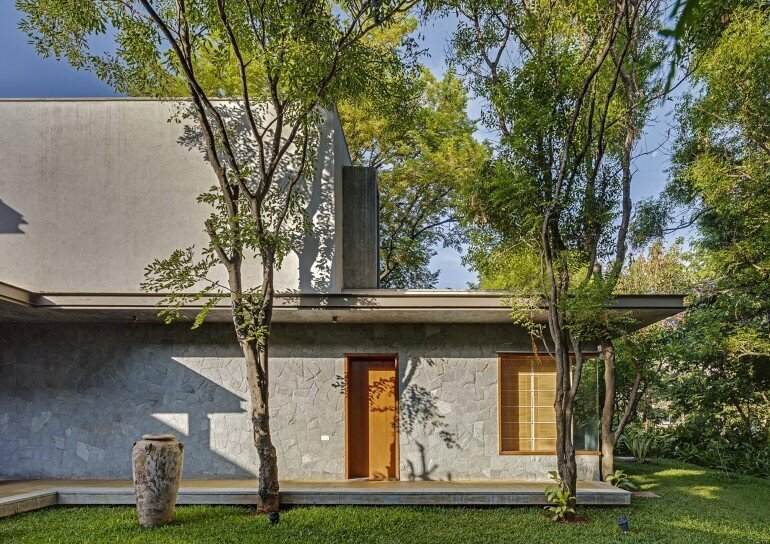 Description by architect: The 16,000 sft site of the Krishnan house had several existing trees and we envisioned a relatively low-slung architectural expression that would be interpretive of a vernacular aesthetic, while accommodating its green surroundings. 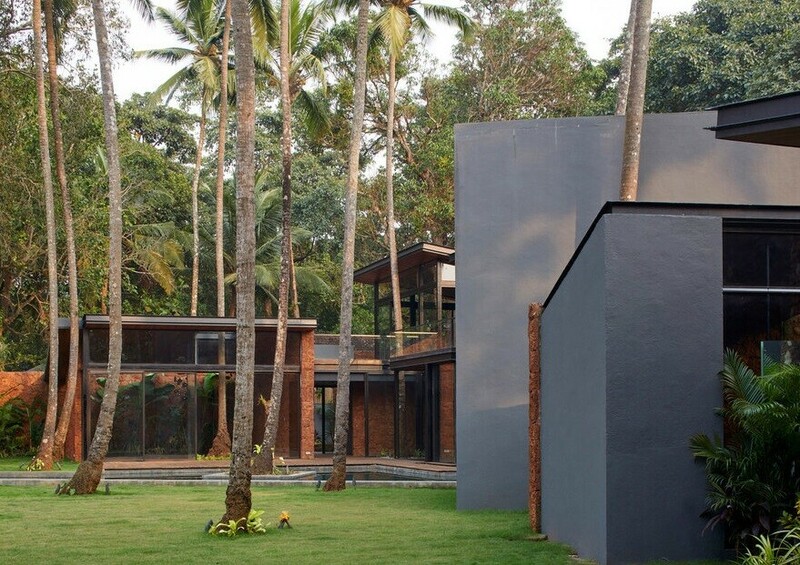 An architecture of sloped Mangalore tiled roofs and rough-cut Shira stone cladding contrasts with floors of rough and polished Kota and joinery of teak. 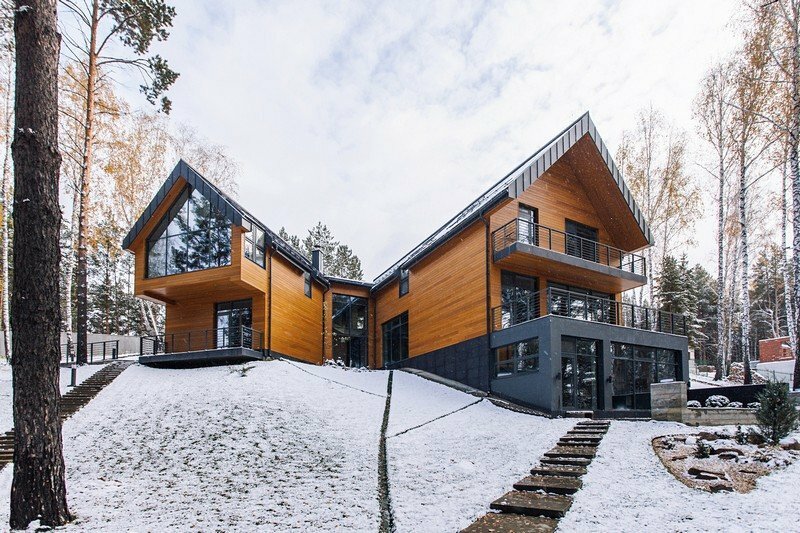 The living space is a grand volume of 25ft with two slopes of the roof at differing heights separated by a clerestory window. 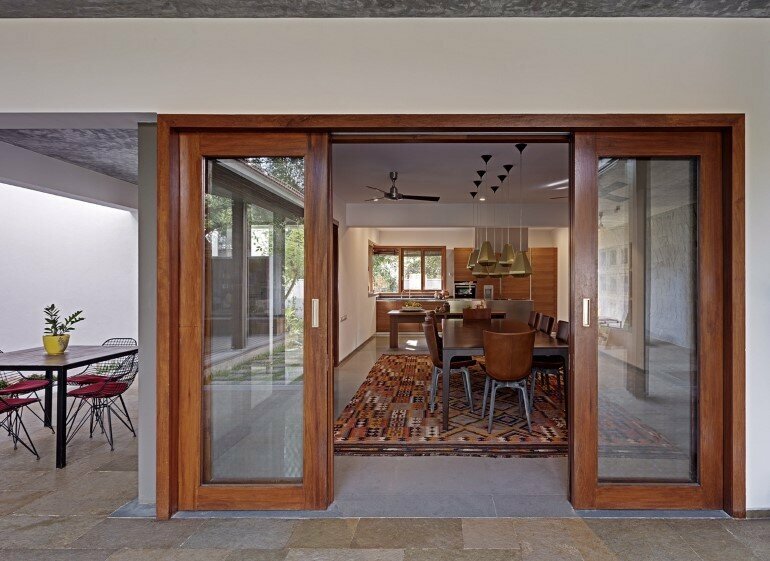 Its verticality is emphasized by large floor-to-ceiling windows with sheer linen blinds that provide soft light in the mornings from the northeast. 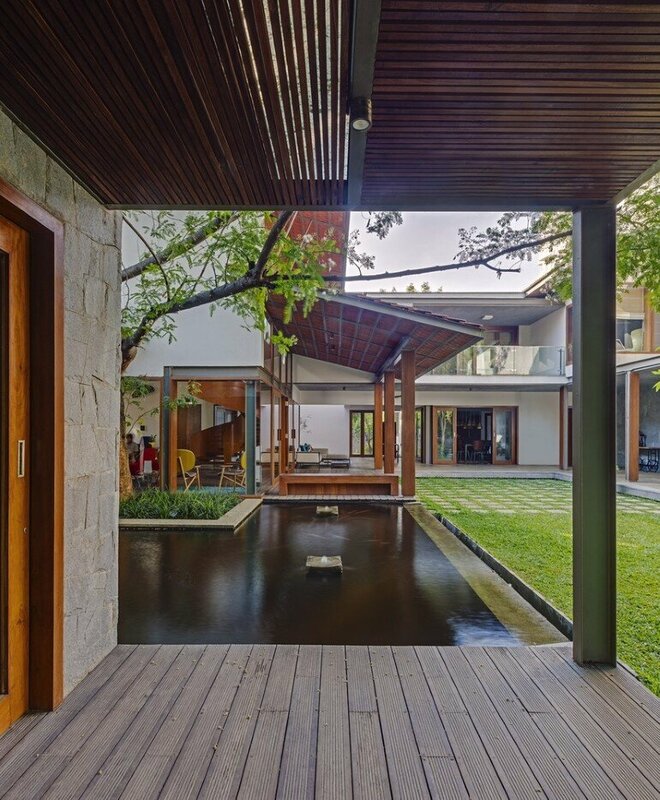 Large overhangs on the southwest protect against the harsh afternoon sun while horizontal timber louvers provide for natural cooling via a stack effect. 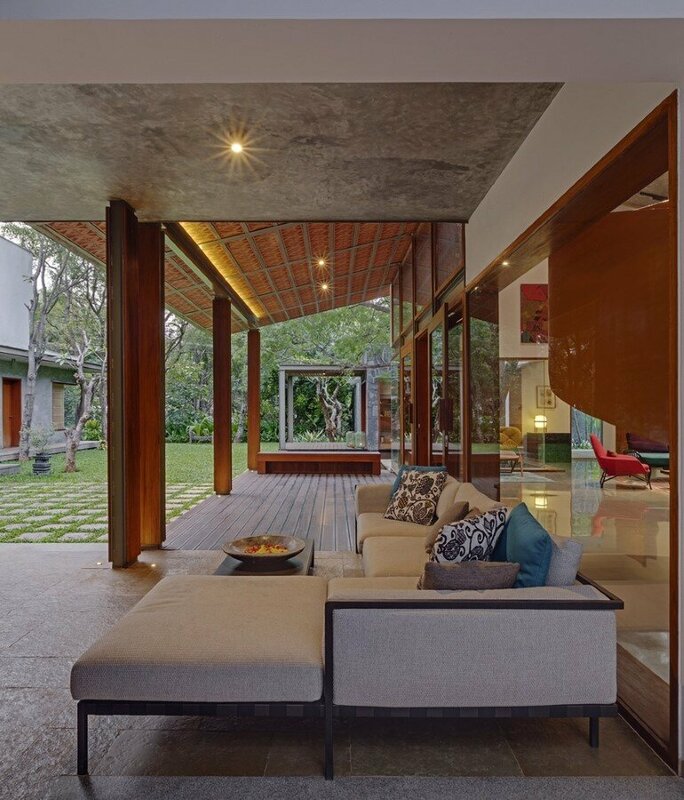 The living areas open to a wooden deck that continues into a wrap around verandah overlooking an internal courtyard garden. 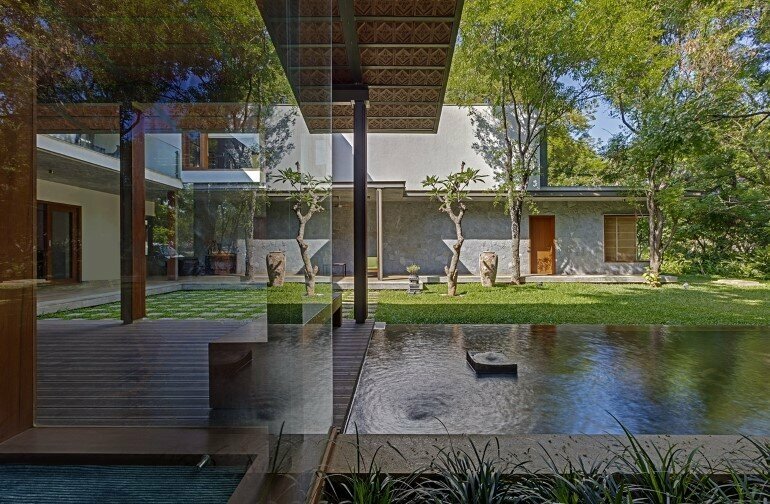 Almost all the spaces on the ground and first level visually flow into it. 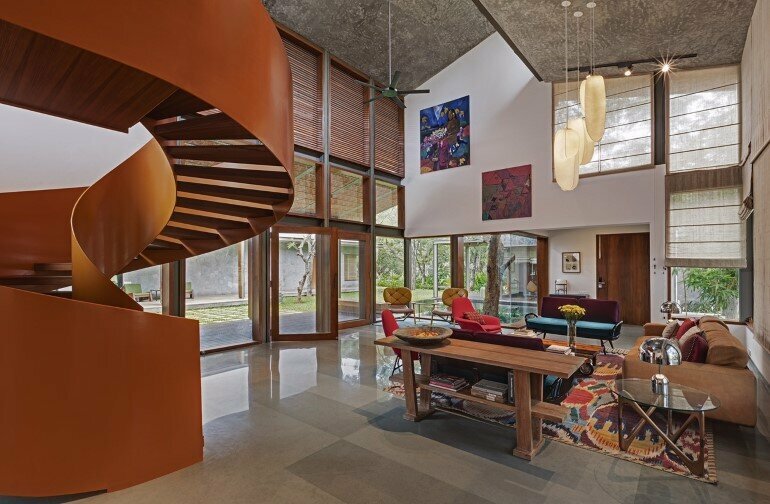 The central feature of the living space is a burnt orange spiral staircase sculpted out of a shell of mild steel and housing timber treads. 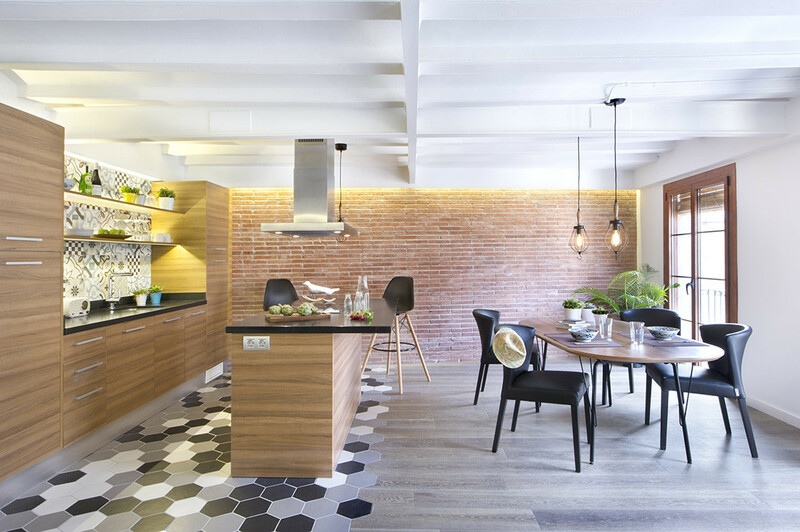 The Large expanses of grey Kota are contrasted with a bright color palette of turquoise, violet, red and mustard. 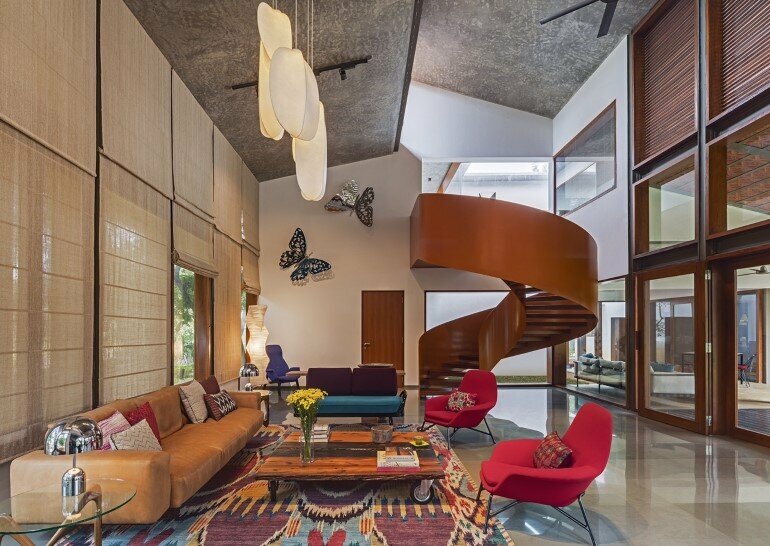 The bold Ikat patterned carpet provides a vibrant base on which pieces by Moroso, Minotti, Riva and Poliform sit alongside other furniture designed by Khosla Associates. 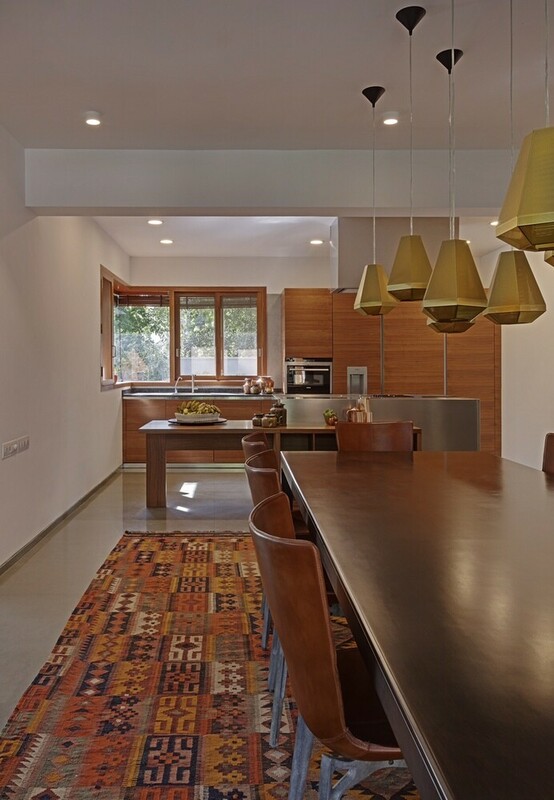 The central cluster of Mori fabric pendant lamps were sourced from New York based design house Rich Brilliant Willing, complemented by other light fixtures by Tom Dixon and Isamu Noguchi. 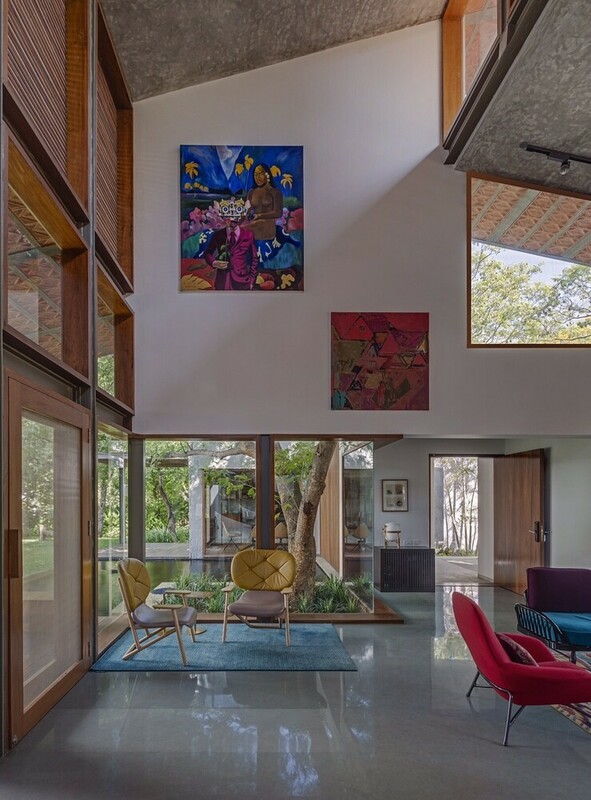 The butterfly sculpture on the wall is Sunil Gawde’s ‘Secret Garden’ and other paintings are by young Bangalore based contemporary artists Shivkumar and Suresh Kumar. 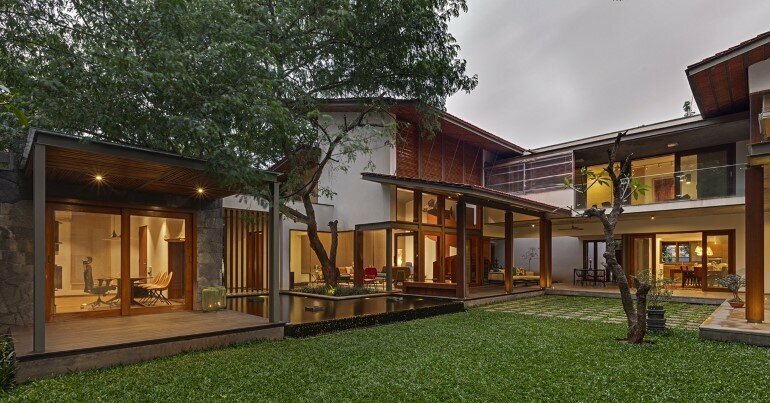 The spatial flow takes into consideration the family’s requirement of segregating public and private space. 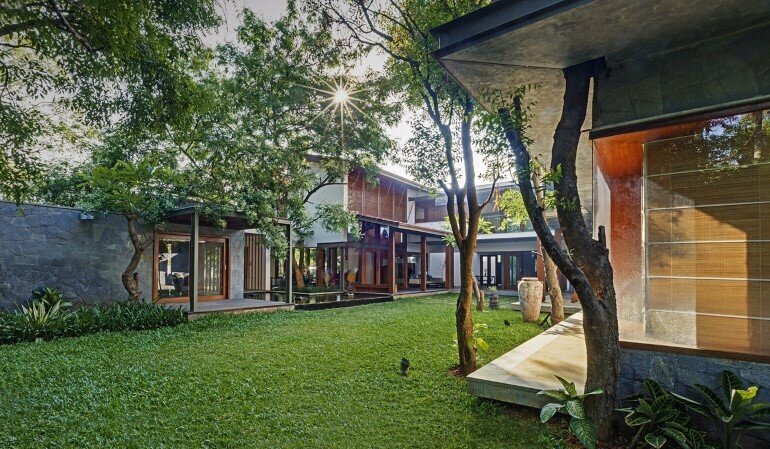 The ground floor has living, study, dining, puja, home theatre, 2 kitchens, and 2 guest rooms while the upper level has 3 bedrooms, a yoga and meditation space and a family room. 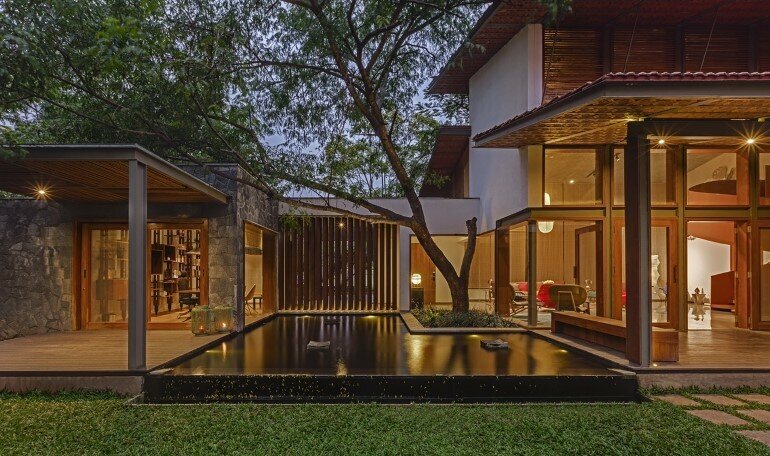 On the garden side, the study and the living rooms flow into their respective verandahs that hug a large pebbled fishpond. 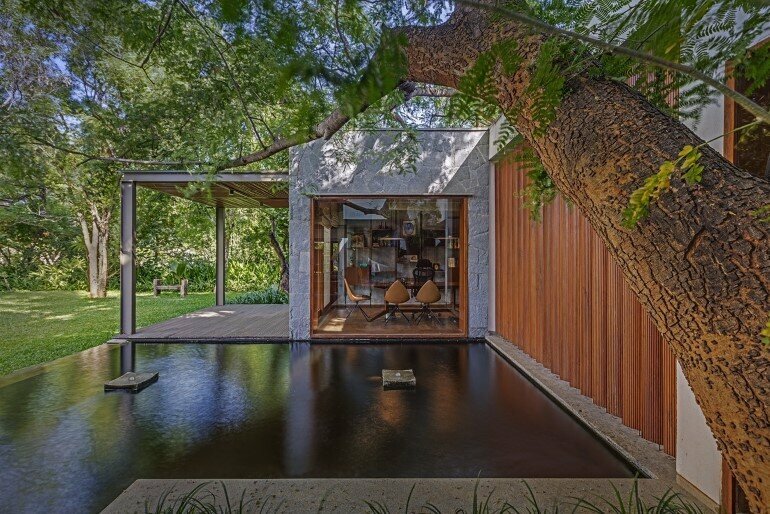 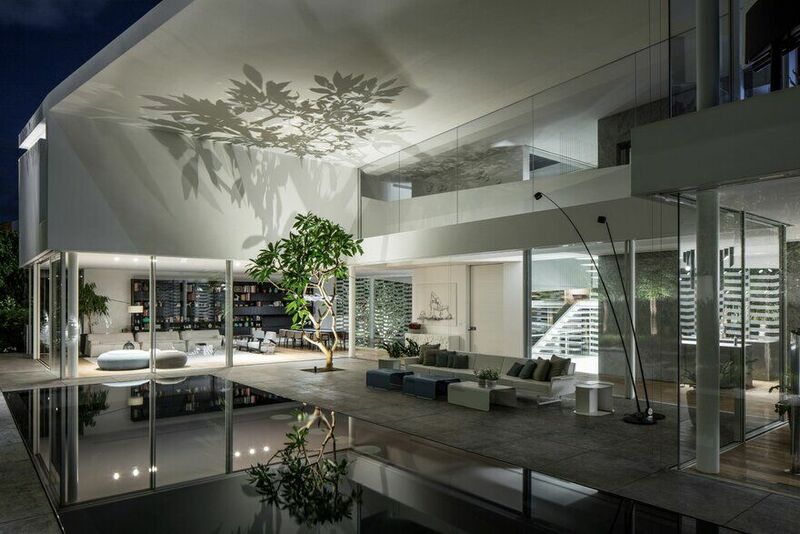 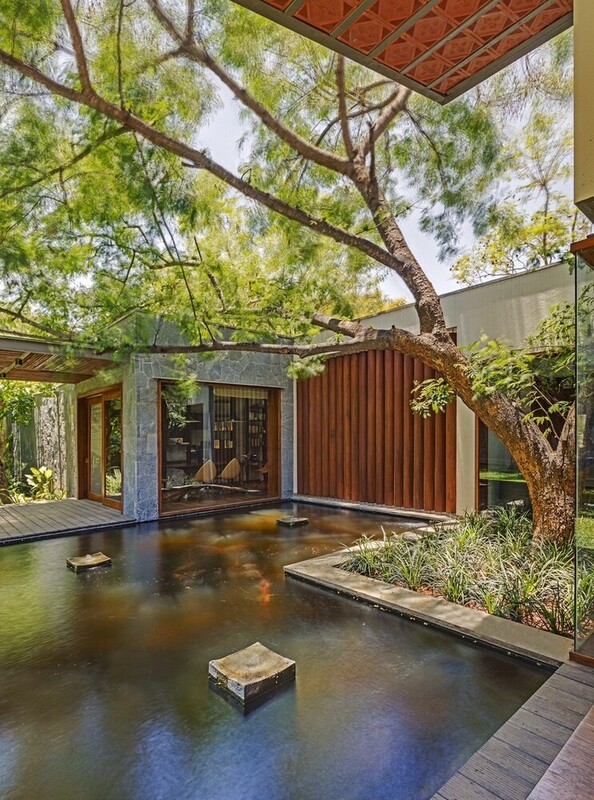 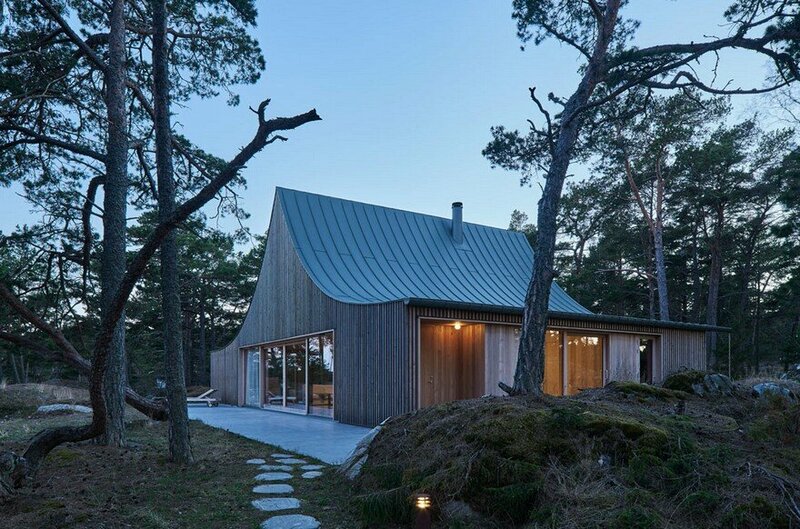 An existing tree emerges from the water and is uniquely framed by the built form of the house on either side and by pivoted vertical timber slats as a backdrop that gently separate it from the house entrance. 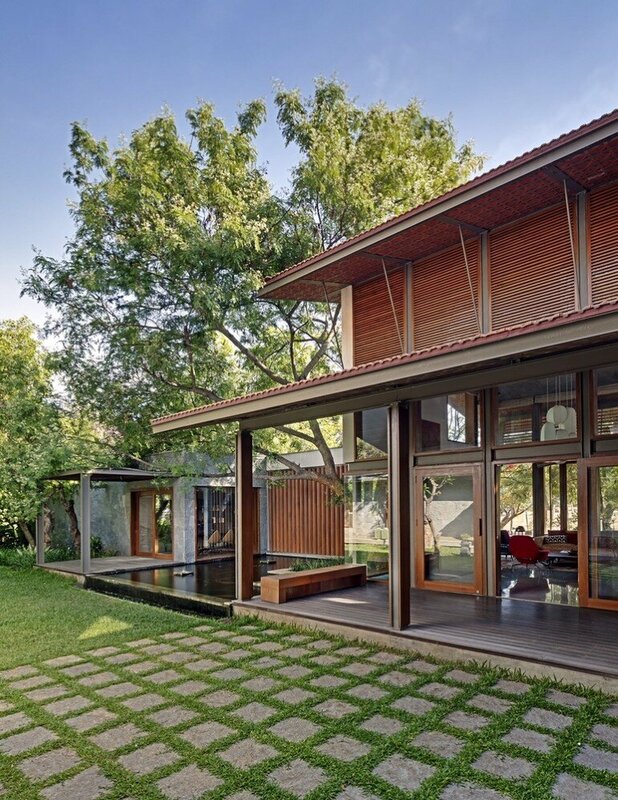 We were driven to create a contextually sensitive and sustainable design by maximizing local materials, using clay tiled roofs to keep the house cool, large overhangs to protect against sun and rain, and cross ventilation to keep the house breathing at all times. 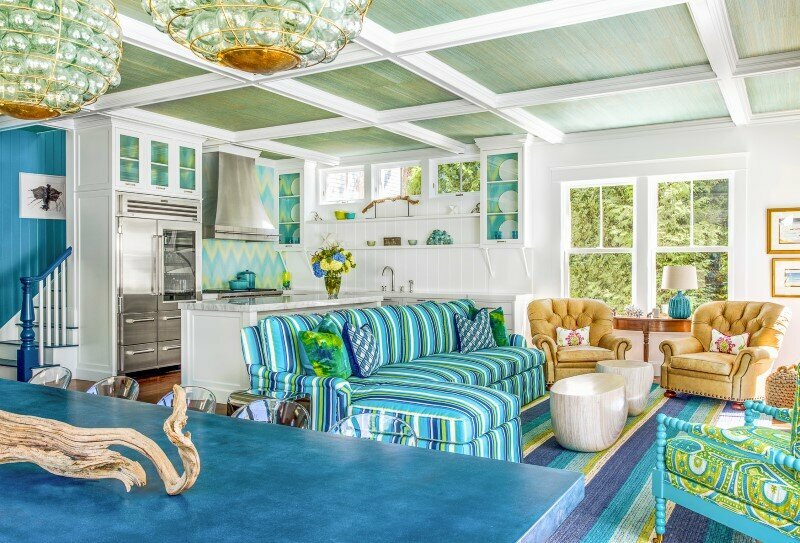 As firmly as our clients were rooted to their traditions , they were also global travellers equally open to an eclectic design aesthetic that is reflected in the house interiors.